Carol Louise Foley McConkie was sustained as the first counselor to the General Young Women’s presidency at the April 2013 General Conference of The Church of Jesus Christ of Latter-day Saints. She was released on March 31, 2018. The Young Women’s program is an auxiliary program for teenage girls and this presidency oversees the program worldwide. The president and two counselors work together to run the program. Carol McConkie has served as a president of the Young Women’s program at the ward (congregational) level, as well as in the Primary (an auxiliary for children) and the Relief Society (for adult women). Her most recent calling was that of a member of the Young Women General Board, which assists the presidency in the work of the auxiliary. 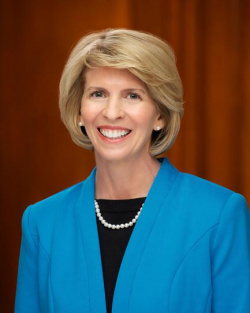 From 2005 to 2008 she served with her husband, Oscar W. McConkie III, who was the mission president for the California San Jose Mission, a position that involves overseeing all missionaries within a certain geographical area. She has a bachelor’s degree in English from Arizona State University. She and her husband have seven children. This page was last edited on 3 April 2018, at 21:47.